Create a personal knowledge base for your notes, documentation, lessons learned, and more. Personal Knowbase is a freeform knowledge management system for Windows. Organize a large amount of data easily using a natural way to retrieve notes, using keywords to tag records and filter for related information. Take control of your knowledge with Personal Knowbase. Record notes quickly without having to navigate deep data trees. Cross-reference your data with hypertext links. Share knowledge with colleagues using the PK Reader viewer program. Because of Personal Knowbase's flexible, freeform text database structure, you can use the program as a knowledge manager for many types of data. 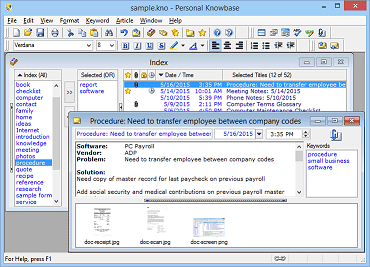 Personal Knowbase can be used to share knowledge within your business or organization by creating a database then distributing it with the PK Reader viewer software for Personal Knowbase files. Distribute your shared knowledge repository across a network or using a CD bundled with PK Reader. Share documentation across your organization. Document and disseminate Lessons Learned to prevent repeating mistakes on future projects. Distribute procedures, directions, and how-to articles to colleagues. Get Personal Knowbase Knowledge Base Software Today! Carry your notes with you for use on any Windows PC. Run Personal Knowbase from a USB drive.